Wow, what a gown! The simple beaded straps lead into a low v-neck front and a matching low v-plunge back. 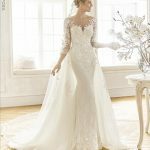 The attention to detail on the bodice is breathtaking as it leads from the detailed illusion plunge on to elegant lace. Furthermore, the simple tulle skirt has an understated elegance of its own. 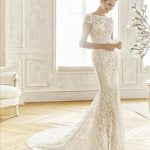 Most importantly the attention to detail on this gown will ensure everyone’s eyes will be coming and going to all parts of your gown.